Pretty fabulous mid century dining set if I do say so myself. 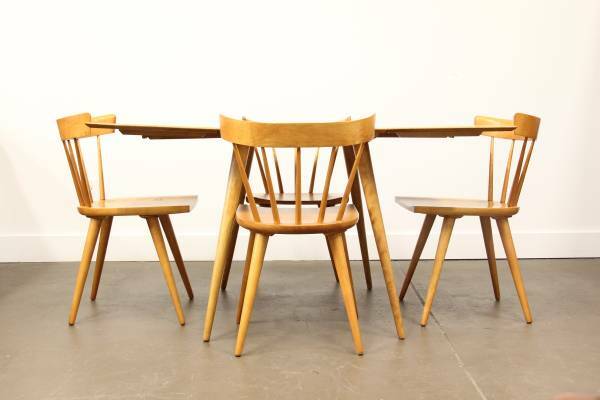 Solid maple table with two drop-down leaves and four chairs. The table is 56"W x 36"D x 29"H, and the chairs are each 17"W x 17"D x 30"H. A striking piece for any space. It is a little hard to see the quality and condition of the travertine top, but the walnut spider leg base and brass footings make this piece fabulous. You can always replace the top with Carrera marble or another updated material. The dimensions are 32" in diameter and 18 1/4" high. The retro atomic fabric needs to go, but HELLO beautiful mid century chair frames! Each chair measures 40"H x 19"W x 14"D with the seat at 17"H. I love the high backs. These would be so lovely in a modern dining room, maybe as side chairs mixed with different host/hostess chairs. Stunning lines and angles in this rare credenza by Lane. I love the center drawers tucked behind doors. The piece is 72"W x 31"H x 19"D. Crendenza's can be used for so many things: as a console table or media storage in a living room, a dresser in a bedroom, or a buffet in a dining room. Oh, or as a storage cabinet/dresser in a kid's room or a bar in a living/dining room. Really, anywhere. This Pottery Barn table is made of "Calvert" cast iron and can be raised or lowered with a turn of the crank. It is 29.75" in diameter, and the height ranges from 30"-42.5". It comes with three black, gun metal chairs. It's a perfect bistro table for an industrial loft or apartment. Frankly, I am not sure how I feel about these chairs. They remind me of baseball gloves or footballs or chairs you sit in while watching football, but I also think they're kind of amazing. In a bright white room with softer textures and paired with some great mid century pieces, I am sure they can be fabulous. Why don't you buy them, style them appropriately, and send me a photo of the end result! Wink. I have a friend who would LOVE this record cabinet! I love the wood grain on the exterior of the door, and how cool that the door drops down?! It could double as storage and a side table. This pieces is also by Lane. 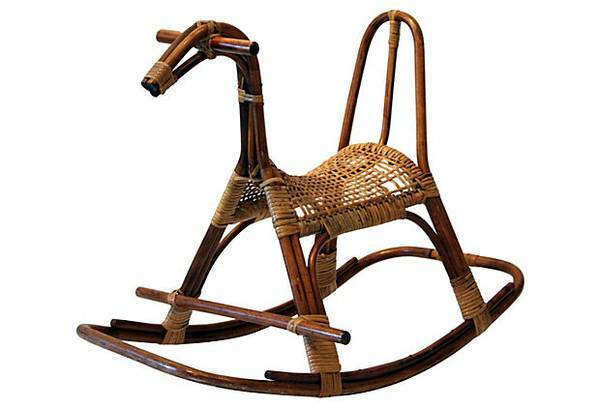 It's dimensions are 28"W x 15 3/4"D x 24"H.
Made of rattan and cane, this rocking horse simply rocks! It is probably my favorite piece in this entire roundup. I can totally see it in a baby's nursery...actually, I can totally plan an entire nursery around this one piece. It measures 29.25"L x 18.5"W x 21.75"H. Do yourself a favor. Buy it. If not for your own child, for your niece, nephew, or neighbor.